into a colourful mosaic of sounds. You will discover alive compositions of high recording quality. 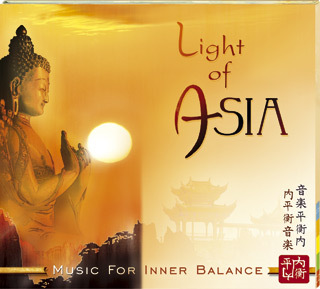 "Light Of Asia" follows the path of a spiritual traveller along Asia's different cultures and traditions of wisdom. and joins the meditation of Zen monks at the sea of Japan. creates a subtle atmosphere to get a balanced and joyous mind. Performing artists: Margot Reisinger shows once more on this album her special talent to produce meditative music. "Music For Inner Balance" series, and several solo albums. who already contributed spiritual mantras and traditional tunes to the album "TIBET - Heart • Beat • Meditation" by Existence. recordings of LIGHT OF ASIA, while the Tibetan Buddhist Monks of Kachoe Ghakyil were recorded by Tom Bates on location in Nepal. The Shakuhachi flute on track 3 is played by James Nyoraku Schlefer from the United States, a true master on this meditative instrument. The skillful participation of US sound engineer Tom Bates (8 Grammy Awards) guarantees highest quality in mixing and sound. and let the "Light Of Asia" shine through you! Aroma Therapy, Shiatsu, Qi Gong, Yoga, Tai Chi and many others.